From the ACL Fest department... 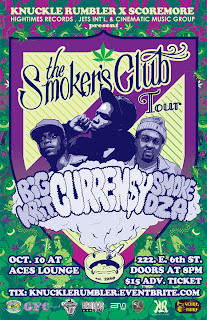 Score More presents The Smoker's Club Tour with Curren$y, Big Krit, Smoke Dza @ Aces Lounge on Oct 10th! Like all Score More shows, this'll be another dope one... pardon the pun! Becoming a teenager, he was signed to Master P's No Limit Records until 2005. He then signed with Cash Money Records and Lil Wayne's Young Money Entertainment, where he remained there until late 2007. While still at Young Money, Curren$y created Fly Society with skateboarder Terry Kennedy, first as a clothing company, then expanding to release music. He released the song, "Where Da Cash At" as the lead single for his Young Money debut, Music to Fly to, in 2006 but due to several push backs and lack of promotion, Curren$y decided to leave the label and venture off to do business on his own. 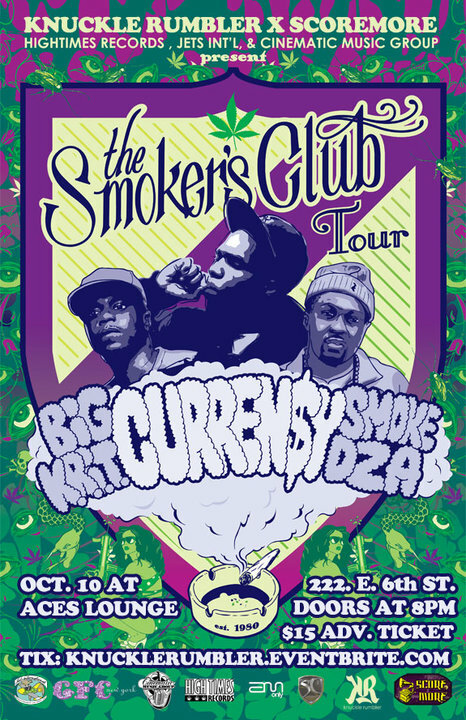 For several months, Curren$y released a series of mixtapes to gain notoriety. His work was impressive enough to land him on the cover of the XXL Magazine Freshmen 10 of 2009. Though he now had the cosign of one of the top hip-hop magazines, Curren$y was still overlooked by major labels. He then chose to sign with Amalgam Digital to release his debut album, This Ain't No Mixtape , in 2009.